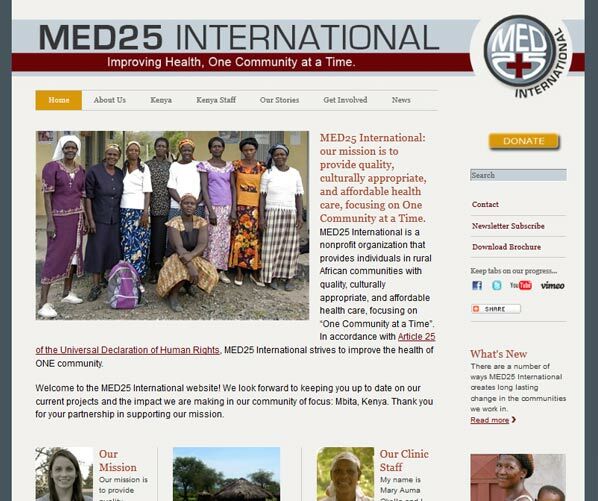 MED25 is a non-profit organization dedicated to providing access to basic healthcare for those who need it most one community at a time. Their efforts are currently focused in Mbita in Kenya. Successful projects, such as peer educators, clinic equipment and spreading basic health awareness are highlighted. Initiatives such as a community clinic and mortuary are the newest projects soliciting funding. Because MED25 wanted to be able to update their content as situations changed and events were publicized, the site was custom designed on the WordPress platform. MED25 wanted to target potential donors, so the site was designed for ease in navigation to access information pertinent to that audience. We also implemented third party APIs for Facebook updates and the Click & Pledge donation payment gateway.